Sorry. Praying God’s healing power for you and yours. Thank you for following me on Twitter. I pray that you keep positive. When my daughter was five years old she was diagnosed with a malignant tumor, an Astrocytoma of the Cerebellum. Like you and your wife, we were devastated. I decided that I would look only at the positive results of those healed of this tumor, and not see my daughter as a negative statistic. She had three separate operations over several years, and lots of scans. But she also had thousands of prayers, as you have. The wonderful news is that she was cured! She’s now the mother of three little boys. I will be praying for you daily, and checking your updates. Thank you so much for sharing! It is so difficult now with everything going on but I continue to paint and be optimistic. Reblogged this. I hope it helps. This is an artist I follow. He is going through a hard time, struggling with a brain tumor, and I wanted to help him by rebloging this. Please read. We are honored thank you from our family to yours! Hello Ray, I was captivated by your art. My son goes to art high school in Italy and is following you too. We are grateful for your art. We pray for you. Reblogged this on Hold My Broom. Re-blogged and all my thoughts and prayers Ray. Off my usual topics I know, but you’ll understand why. Feel free to re-blog and pass on to anyone. Reblogged this on Maggie Leal. Thank you so much, from my family to yours! Thanks for sharing. Love your honesty. Love your art too and recent Bob Marley pic. Will share your light for sure. Maybe you can connect with my Babes with Brains friend at greymatterlife.com who has a brain tumor and is on board of SoutheasternBrainTumorFoundation and the cool race for research. Also TrishRohr.com whose hubby has one. Keep on Urbanwallart and family! I will reblog this . My friend used to be into art now will start again i will look into it as a gift. Reblogged this on New Pollyanna. Honored for the reblog! Thank you so much! My pleasure. Not so many will see it on my blog, so I sent it over to my Facebook page as well. Thank you so much!!! So honored and humbled! Reblogged this on See Paul Blog. Thank you! Honored for the reblog! How can I put like to this, I did share it though. I have been fighting COPD, it’s going to get me, so I know well what you are facing, hope my sharing helps. Wishing you and yours well, don’t give in, tomorrow is ours for good work; and God’s helping hand, so don’t give up. Interested in art? Paintings? Here is your chance to get your hands on some amazing paintings and helping someone in need with your purchase. Go on.. It’s a win-win!!! Noo, I learned this in my bio class but I can’t say anything really ..your art is amazing and I can’t buy those items for funding but in support I will say hope you feel much better ..and reblog this for your words to be heard so others can fund tooo. Reblogged this on is me is really me. Thank you so much!!! Very honored! I am honored you would reblog this!! I can’t afford to buy your work but I enjoy seeing it and I’m sure others that may see this will too. So maybe by proxy I am helping. Just having the support and love from the community is MORE than enough! I feel so overwhelmed with joy that you would even comment! Thank you! Although I’m unable to purchase anything (sadly, because I’ve seen pieces of your work that I would absolutely love to have), I’m sending thoughts and prayers for you at this difficult time in your life. I pray that you will recover soon. May God bless you and yours. Ray’s Brain Scan…just keeping you in the loop. If you have a piece that has Bowie as the subject, I’d buy it. Get well soon Ray. I pray for God’s divine healing for you and the power of encouragement over your entire family in the name of Jesus Christ. Reblogged this on Our Personal Journey. I’m sorry I can’t help you with money. But your works really amazing. Tell your body to fight that tumor. People said, sometimes your mind is more powerfull than medicine. And also don’t forget to pray (because I will pray for you too). Just being supportive is more than any dollar could amount to! Thoughts and prayers go out to this amazing artist. Thank you so much!! It means everything to me to be surrounded by such great people and love! I’m sorry I can’t help with money, but please know that me and my family, and also friends that saw this post, we will be praying for you! Hey by the way, your stuff is amazing! Thank you so much! Have to offer 50% off of everything right now to help raise funds. My family and I will be praying for you my new friend. I know what you’re going through as I was diagnosed with Leukemia a year ago Feb 13th. It’s tough not knowing the future but it looks as though you have a ton of friends to help you pull through this difficult time. Wonderful artist, Ray Ferrer in need of help, read and do what you can. Reblogged this on Dash of Purple Pepper. Know that you and your wife are always in my prayers! Hang on there. Bought a piece of your art – am a big Star Wars fan so no prizes for which one I bought. Also donated; keep fighting and stay positive Ray! Share my friends. About Ray Ferrer! God bless you! Stay positive and remain faithful. Doing just that! Easy when I have such a strong support group behind me. Thank you for always being here with me! Another talent dealing with cancer. Let’s send our best wishes; and if you can help him in anyway please do. I was lucky to get a lot of free medical care because I live in the UK. It’s not so easy elsewhere. ‘Fraid brain tumours are always a little hairy. No wonder you presented seizures though! Finger crossed! I hope the white fuzziness is swelling, and the tumour is only wide and not deep! REDdog, thank you! I needed some inspiration and this may be something great! I don’t usually reblog these things, but this man’s work is amazing. You really should check it out. sending good thoughts and prayers from Arizona. hope all goes well. sorry I don’t have any profound Christian-ese vocabulary, clichés, or pat answers for you. all I have is prayer for you and your family. Mike, that is MORE than enough! I will keep you in my prayers while you and your wife are going through this most challenging time. Reblogged this on Thinking Big with Bethel. I saw this post in my reader and I’m glad I found your blog. I’m looking forward to your artwork. My thoughts and prayers are with you. Praying for you and your lovely family. Nothing is difficult for God to do. I am so humbled and honored! This post speaks for itself. So sorry to read this Ray. I am praying for you. The print I think is 14″ x 11″ Listed on the site. You are incredibly brave. I am sending you (and all those you touch) love, strength and the best vibes I can muster. Oh mate, I wish you the very best, and hope that its not as bad as it looks. The body is an amazing thing. Tweeted and reblogged. Hang in there Ray!!! Do all you can, and continue to pour your soul out there through your artwork! Sending hugs and visiting your page now! Thank you so much for these words of encouragement! Added a wee bit to your GoFundMe page. All my best wishes! A little from a lot helps! XO Best wishes. Recently I started following an artist in California – I was/ hoping that one day I can commission a family portrait from him. He does great spray paint artwork – something a bit different and that I always enjoy. The artist, Ray has been diagnosed with a large brain tumor. So to raise money for his care, he has asked us followers to share his art sale. I know there aren’t many of you following me but I am hoping some of his art will catch your fancy and you can have the opportunity to get something unique for your home. I will still continue to follow this blog and in a year or so can afford to commission something fantastic from him. Thank you so much for the lovely words and for sharing! Best wishes to you Ray, it’s a tough road; but you are surrounded by love. Indeed I am! I am just so honored and humbled by the lives I have touched over the years and the relationships I have built! One big family!!! I’m re-posting this for Ray. I have been following Ray for over a year now and was stunned when he shared this news. Let’s all go over to Etsy and buy a print…. Though I’m a relative “newbie” to your blog, I’ve enjoyed your creative postings and keep you in my thoughts and prayers. In support of a great man and artist. This scan would make one helluva stencil, if/when you’re ever up for that. Continuing to pray for you and your wife. Thank you! Perhaps one day! My brother I will be in prayer with you and for you as you journey through this time and space. With the Lord living in you, rest assured that you are in good hands. For He is the greatest Doctor you could have in a time such as this. Be Encouraged and continue to live in His peace. If any of you are looking for a great gift for someone, or you just want a fantastic piece of artwork for your wall please check out Ray’s Etsy store and support him and his wife during this tough time. So honored for your kindness! Again, my friends, I’m asking for your support for artist and fellow blogger Ray Ferrer as he battles a brain tumor. Head to his Etsy and/or GoFundMe pages and donate and/or buy some really excellent art, or just offer some support and positive thoughts. Thank you! Words cant describe how I feel right now! Oh I can feel it! Hope the tumour is removed soon. For a blogger in need as things like this can strike at any time. For a human being who deserves health and to enjoy life like the rest of us. Thank you so much from my family to yours! I feel like the world is on my side and that is powerful stuff!! Thank you, Iris! I hope so too! Please do help my Wonderful Artist friend.. Please be so kind as to look over this guy’s artwork, he has been diagnosed with a brain tumor and he and his wife could use the support! Thank you and please pass it on! Ray have faith on the Almighty. We all are with you and here for your help. Hope everything gonna be alright. I want to reblog this. May i ?? Renowned Artist Ray Ferrer Shares An Update On His Medical Condition & What You Can Do To Help! Ray, I bought your Einstein piece. I cant wait to show it to my daughter. I wish you the best and you are in my prayers. Both of you! Jim, thank you. Overwhelmed by the kindness. Moved to tears as I read each of these comments. If you can read what it says on that rock that the bear is holding, it might help. Reblogged and sending positive energy, thoughts and warmth from all of us. Peace! Ray Ferrer has dedicated his artistic endeavors to creating fascinating pieces which many of us love and share. this time is a very trying one for Ray and his family. Head over to check out his beautiful work and enjoy a great discount while helping them through this period. Such an amazing spirit with this man, a true fighter and believer, with a such a great talent it shows in his art work. Thank you so much! We can do this together! You truly have a powerful soul. I know you can beat this!! I am an herbalist if you would like any advice let me know. Laina_poulakos@hotmail.com fight on Ray! Reblogged this on Questing Cwen. Just as you say: things WILL move forward and in the best possible way! I am determined and my family (including all of you) have my back. I know I am not alone! In recent times many of us got together to support some bloggers, who had their blog accounts discontinued. Our community of bloggers showed that it can stand up for each other when is needed. This is the time to help Ray Ferrer, who needs our help to raise enough funds to support his brain cancer treatment. I truly wish you much strength and resilience. It’s hard but may the love and support of your family and friends make this journey a smoother one. Most sincerely, I wish you all the best. It is a journey, as you know having seen my blog, that I have walked with my wife. Indeed! I feel loved from all over the world and glad that I touched so many. Thank you for being here for me as well! There is no other way to say this but Ray needs our support. So please buy his artwork (which is fabulous and would look great on your wall btw). There is power in community. In people connecting with one another. In compassion. And in the courage of the fight. Let’s show our support!! Thank you for ALWAYS being a supporter of my work through good times and bad! Oh…urbanwallart, i’m so sorry. You are in my thoughts….your beautiful artwork hangs in my husband’s office…we will look into buying more. oh and your very cool t-shirt with the sister rocking the fro..it’s awesome. Thank you! I am honored to have touched so many people! OMG. 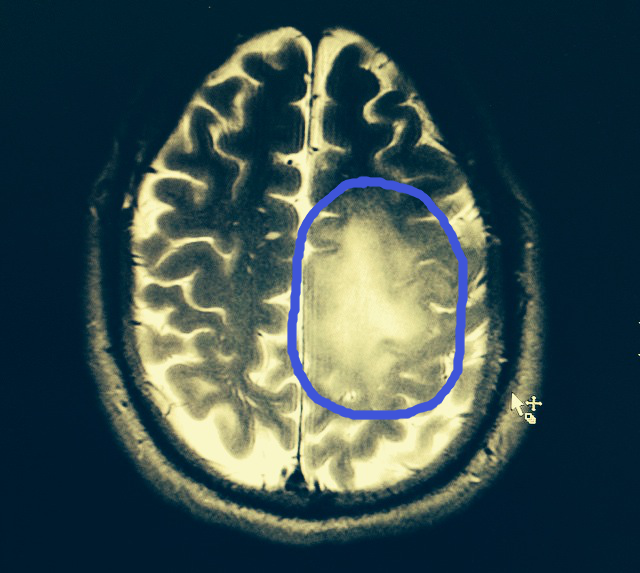 My mom had this one…glioma? PLEASE, research alternative treatments that break the blood-brain barrier. That is the critical aspect. And, get the best gamma knife pinpoint radiation available. Prayers for you and your wife. Please read, donate and/or buy some of Ray’s art to help fund for his treatment. Oh, and reblog and get the word out. Our brother artist needs us now! I’m going to reblog this, share your fundraiser and link to your art on Etsy. You are kept in prayers and we are all right here for you Ray! The least I can do…prayers are with you! !